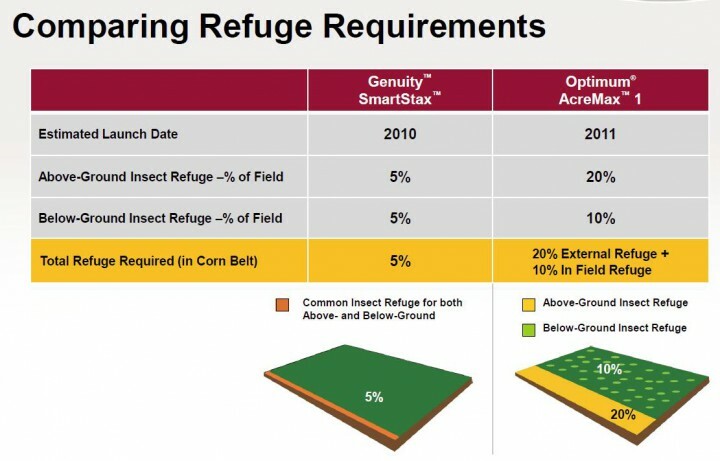 The agency’s “refuge” requirements (farmers who plant crops with Bt traits must also plant a block or strip of crops without the Bt gene, which is called a refuge) for Bt-expressing crops, for example, are set at too small a percentage and aren’t enforced. They are therefore widely disobeyed, even by those with inadequate acreages. Ironically, Monsanto and the corporate media scapegoat farmers for using “too much Roundup,” which is an absurd accusation when Monsanto makes “Round Up Ready” crops. That’s no different than a crack dealer getting upset that his clients use too much crack. Circular logic? Yes. The plan is that they DON’T survive. Agenda 21 is all about destroying all family farms and all non-GMO food. The only “food” under their system will be GMO full of toxins- except for the elite, of course. THEY will have non GMO food grown from hierloom seeds. That is why they are doing everything they can to destroy independent farmers as fast as possible under whatever pretext they can come up with. After all, if you control the food you control the people. “Obey us or starve”. Also see State Department Memorandum 200, signed by then Secretary of State Henry Kissinger in Dec, 1974 for more insights into the plan. Let’s see…Russia (pop. 146,270,033), Austria (pop. 8,572,895), Bulgaria (pop. 7,205,677), GERMANY (pop. 80,767,463), Greece (pop. 11,000,000), Hungary (pop. 9,877,000), Ireland (pop. 6,197,100),Japan (pop. 125,000,000), Luxemburg (pop.549,680), Madeira (pop.267,785), New Zealand (pop. 4,519,000), Peru (pop. 7,605,742), S. Australia (pop. 1,682,600), France (pop. 65,430,000), Switzerland (pop. 8,100,000) Bavaria (pop. 12,423,000) and China (1,367,820,000) ALL have outright BANNED GMOs…that’s 1,863,286,875 people who do NOT eat them. Meanwhile, in the US (pop. 324,646,348) we are forced to eat GMOs whether we like it or not, but the tide is turning as more and more demand for ORGANIC crops (you can’t deny that there is a big surge in organics) will turn farmers away from your merry-go-round of poisons and back to organic (or as I like to put it…truly conventional farming) without the use of harmful chemicals simply because there is high demand and the use of terminator seeds has scared farmers away from your corporate poison peddlers. Can you explain any of your information here other than what you read on the internet? Do you any facts backing things up – like USDA persecuting their staff – that is a pretty serious accusation that should be investigated. You didn’t mention Michael Taylor of FDA who has for 10 years been persecuted as a corrupt government workers without a thread of evidence. I think you need to put up or shut up. Have the decency to take time to research your blogs and try to see both sides. Here is why I am so annoyed by this. There are things that really threaten our health and environment. The number one for cancer is smoking and radon gas – look that one up. For food it is eating too many calories no matter where they come from. It is not gluten. It is bacterial contamination of food that is actually killing people now (often organic food) and not pesticide residues and certainly not GM crops. Yes I would love us to get rid of all pesticides including the organic ones but we can’t without dying of starvation. Better breeding and GM could rid us of most insecticides and fungicides. We may even be able to make plants that kill local weeds “naturally”. The science is clear – pesticides are not the biggest threat. Labeling food all over is also not the answer – look at the UK – labels all over and horse meat sold as beef. Labeling without testing is worse than useless. The really important label – may contain peanut allergen is missed. BTW you know that KIWI fruits is lethal to some – but is it labeled as such ? No. what has antibiotics got to do with Bt ? You also forgot to mention that there are three more agencies at the WHO who say glyphosate is not a carcinogen and the classification that was given includes barber shops, coffee, and pickled veggies. The WHO group studied it for 4 hours at a conference and didn’t consider all data, while the German government study that showed it is not a carcinogen studied it for 4 years and look at all data. A technical aspect of tox studies is if something is toxic it should increase in toxicity as the dose increases – for example if a little alcohol is bad for you more should also be bad for you. In some isolated badly run studies – there was sign of carcinogenicity with one low does but nothing at higher levels – to a skilled toxicologist this means the small affect at low does is a false reading. Also if you take natural ingredients in natural organic food and any other food and concentrate them up to very high levels and feed them to toxin sensitive rats virtually everything is toxic – it is a matter of dose. Glyphosate is less toxic than table salt in these studies. The highest Glyphosate residue found in fields or food is 1000x lower than the level that could affect humans so dose matters. You might as well ban Dove soap as a possible carcinogen as it will destroy human cell sin culture far quicker than glyphosate but the assay has no meaning since many perfectly harmless things will affect human cells in culture. I also like the terminator gene mention – classic ignorant fool write up – terminator genes were never developed by Monsanto and never in development but the web has been full of terminator seed or genes that are used as slogans. You haven’t really got a clue what you are writing out. BTW if Bt crops have failed then what are they still used on most of the corn acres and even growing in Brazil etc. Listing the Wall Street Journal and another website as a reliable source is also another bad practice you follow. How is a liberal arts educated journalist qualified to be able to expound of scientific studies? At least quote scientists – but then again that wouldn’t be natural would it. We might as well have the clergy do the scientific research from now on. Let me correct your readers on the facts since you seem to ignore them. The refuge is a limited amount of non Bt plants that allow wild type insects to survive and grow – they are not affected by the surrounding corn. Crosspollination is not a factor. Most corn actually pollinates itself – the pollen can move but most less than 660 ft. the insects feed on the leaves etc not the pollen. Wild type insects survive and grow better than the insects that have become tolerant to the Bt. The insect population has a very rare numbers of mutants that can resistant anything some resistant Bt, some resistant to a chemical insecticide, some resistant rotation with soy (its complicated). When you put pressure on the insects with e.g. Bt most die but that tiny fraction maybe I in 10000000000000 survive and will eventually become the predominant insects – except scientists have seen that the mutant forms don’t compete well with wild type insects and when they interbreed with the wild type they lose their resistance to Bt. So having a small fraction of refuge plants without Bt in a field allows the wild types to be there in much greater numbers than the rare natural mutants and stops the mutants from being a problem. The farmers were required to follow planting refuge and that was one reason seed cos required them to sign an agreement – the EPA required Monsanto and others to have a grower agreement. But not all growers follow the recommendations . Would you like Monsanto to sue them ! I guess you would so you could complain. No insecticide sprays (organic or conventional) are even required to do this but they should. So what seed cos did was introduce bags of seed with non-Bt seed mixed in (refuge in the bag) and then no need to plant separate fields. This will eventually solve the issue make farmer’s, Seed cos and EPA lives easier. But then activists like you will have to think up some other thing to complain about but that wouldn’t be a problem because you just make a lot of this up any case.